Hello! Time to hear about MORE great books. I LOVE this Book Talk Tuesday linky that Deanna does on her blog to share books. I have found so many GOOD ones this way! So here we go with my pick for this week. Friends can get mad, and they can get over it. If you follow me you know I love monsters and monster books. 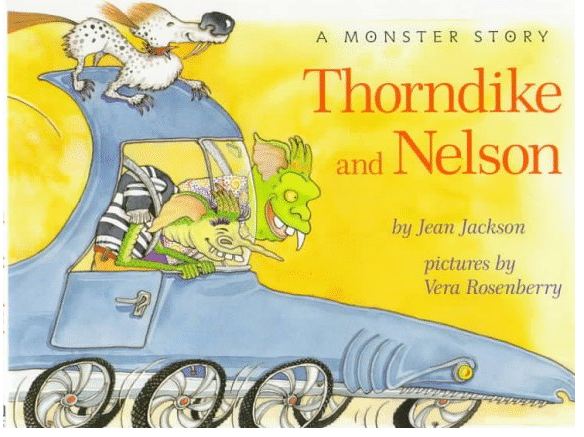 An all time favorite for both me and the kiddos is Thorndike and Nelson by Jean Jackson and Vera Rosenberry. The monsters and their monster activities are fun, but the best elements of the book have to do with friendship. Seeing that friends can get really, really mad, and do some pretty hurtful things to the other, yet still find a way to say sorry and make peace again, is such a relief! If Thorndike and Nelson can, then so can we. We had some terrific class discussions based on this book over the years. Even if you are not as crazy about monsters as I am, you'll find these two good friends good ones to have in your collection. All readers, young and old, can relate to this friendship tale. Check your favorite library or, a bonus– because it is an oldie but goodie, you can find it at very reasonable prices! Click to find more great books!